Children between the ages of 6 months and 2 years are at highest risk of developing acute otitis media (AOM). Children at increased risk of recurrent AOM contract their first episode prior to 12 months, have a sibling with a history of recurrent AOM, are in day care, or have parents who smoke. The pathogenesis of AOM is eustachian tube dysfunction, allowing retention of secretions (serous otitis) and seeding of bacteria. Patient presentations and complaints vary with age. Infants with AOM have vague, nonspecific symptoms (irritability, lethargy, and decreased oral intake). Young children can be irritable, often febrile, and frequently pull at their ears, but they may also be completely asymptomatic. Older children and adults note ear pain, decreased auditory acuity, and occasionally otorrhea. 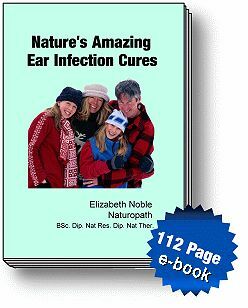 Otitis externa (OE), or swimmer's ear, is an inflammation and infection (bacterial or fungal) of the auricle and external auditory canal (EAC). Typical symptoms include otalgia, pruritus, otorrhea, and hearing loss. Physical examination reveals EAC hyperemia and edema, otorrhea, malodorous discharge, occlusion from debris and swelling, pain with manipulation of the tragus, and periauricular lymphadenopathy. Similar symptoms may be seen with other etiologies. Meniere's disease is usually recognized by the episodic pattern (see later). Herpes simplex virus infection of the vestibular nerve is recognized by a combination of ear pain and the presence of vesicles on the external canal. Acoustic neuroma (discussed later) is recognized by a slower course and the occurrence of hearing loss. Vascular disorders such as a labyrinthine artery infarction are generally impossible to exclude, and their diagnosis is suggested by an identical symptom complex combined with vascular risk factors. The geniculate ganglion level grow into the middle fossa, and those with proximal origin extend into the internal auditory meatus and cerebellopontine angle. Mean age of patients is approximately 40 years.8,10 Facial palsy occurs in most, but not all, cases it can be absent in up to one quarter. Severity of facial weakness ranges from mild paresis to total palsy. It is usually progressive, often proceeded by periods of facial twitching. Sensorineural deafness is usually present. It can be severe or total. However, it is conductive in some cases and rarely the patient can have intact hearing.8 Other symptoms may include vertigo, tinnitus, or ear pain.10 There is a long interval between onset of symptoms and diagnosis. VWhen the pharyngeal tonsil (adenoids) is infected and swollen, it can completely block airflow through the nasal cavity so that breathing through the nose requires an uncomfortable amount of effort. As a result, inhalation occurs through an open mouth. Surgical removal of the adenoids (adenoidectomy) may be necessary if infections, earaches, or breathing problems become chronic. This procedure is used in some cases of chronic ear infection in which the vertical canal has become chronically inflamed and narrowed. In this situation it is important that owners do not believe that this will provide a miracle cure for their animal - usually it just makes treatment of the underlying condition easier and allows air to circulate in the ear canal. Another indication for this surgery is an animal with polyps or a tumour affecting just the vertical canal. It is more commonly carried out in dogs than cats, particularly animals with 'floppy' ears where air circulation is reduced and infection more likely, e.g. labradors and spaniels. Sometimes medication (such as beta-endorphin inhibitors) is used to help decrease self-injurious behaviors. If you suspect that your child's self-injurious behavior is the result of a subclinical seizure (which is not associated with typical seizures but are characterized by abnormal EEG patterns), your child must see a specialist for an extensive EEG workup. If you suspect that the behavior may be the result of illness or pain (e.g., excessive and constant ear swatting may be the result of a chronic ear infection), bring your child to see the pediatrician. Streptococcus pneumoniae is the most common bacterial cause of community-acquired respiratory tract infections. Spneumoniae causes approximately 3,000 cases of meningitis, 50,000 cases of bacteremia, 500,000 cases of pneumonia, and over 1 million cases of otitis media each year. The increasing prevalence of drug-resistant S pneumoniae has highlighted the need to prevent infection through vaccination. Both licensed pneumococcal vaccines are highly effective in preventing disease from the common S pneumoniae sero-types that cause human disease. The host is an important determinant of susceptibility to meningitis. Obvious risk factors include a history of recent open trauma, surgery (especially neurosurgery), and burns. Closed-head trauma can cause cerebrospinal fluid (CSF) leaks, which have been associated with pneumococcal meningitis. Common predisposing factors include otitis media (most common), sinusitis, mastoiditis, alcoholism, perinatal exposure, and nonimmunized, immunocompromised, or asplenic status (Swartz, 1997). Tomic sites, producing otitis media, mastoiditis, tonsillar abscesses, or osteomyelitis. Puerperal sepsis, or childbed fever, occurs when streptococci, introduced at delivery, invade the internal lining of the uterus. Group A streptococci can cause impetigo (a superficial skin infection), cellulitis, and erysipelas (a life-threatening, rapidly progressing soft tissue infection). Over 50 of children younger than 5 years of age live in homes with at least one adult smoker. Children of smoking parents have more bronchitis and pneumonia during their first year of life and more otitis media when older. They have increased incidence of cough, bronchitis, and pneumonia proportional to the number of cigarettes smoked by the parents, particularly the mother. In fact, children of parents who smoke at least a half-pack a day have almost twice the risk of hospitalization for a respiratory illness. Secondhand smoke causes new-onset asthma in exposed children, and young persons with asthma have more asthma episodes (Charlton, 1994 Rantakallio, 1978 USHHS Report of the Surgeon General , 2006). A brain abscess (or subdural empyema) may occur as a result of direct spread from infected sinuses, otitis media or a penetrating wound, or by the haematogenous route (Fig. 19.3). Haematogenous brain abscesses are more likely to be multiple and are thought more likely in patients with a cardiac septal defect that allows the normal bacterial filtering action of the lung to be bypassed. Purulent otitis media with progressive destruction and coalescence of air cells. Medial wall erosion can cause cavernous sinus thrombosis, facial nerve palsy, meningitis, brain abscess, and sepsis. With the use of antibiotics for acute otitis media, the incidence of mastoiditis has fallen sharply. Patients present with fever, chills, postauricular ear pain, and frequently discharge from the external auditory canal. Patients may have tenderness, erythema, swelling, and fluctuance over the mastoid process proptosis of the pinna erythema of the posterior-superior external auditory canal wall and purulent otorrhea through a tympanic membrane perforation. Is the palate intact Figure 12-32 shows a severe cleft palate. Clefts of the palate and lips are distinct entities but are closely related embryologically, functionally, and genetically. The incidence of an isolated cleft palate is 1 per 1000 births. Clefts of the palate vary widely in size and shape. They can extend from the soft palate, to the hard palate, and to the incisive foramen. Recurrent otitis media, hearing loss, and speech defects are frequent complications. The examination proceeds with an inspection of the external ear and ear canal looking for malformations, infections, masses, or asymmetry. Next, the tympanic membranes should be inspected for wax, perforation, otitis, or mass lesions. It is usually prudent to remove wax before embarking on more sophisticated diagnostic procedures. The tympanic membranes contribute about 20 db to the hearing level. Disorders such as perforation, scarring, fluid accumulation, or wax impaction can cause a conductive hearing loss. A normal tympanic membrane is translucent. Fluid behind the tympanic membrane imparts a straw color. The pathogens involved are similar to those causing tonsillitis, especially streptococcal species, but many infections are polymicrobial and involve anaerobic bacteria. Patients present with a fever, severe sore throat that is often out of proportion to physical findings, localization of symptoms to one side of the throat, trismus, drooling, dysphagia, dysphonia, fetid breath, and ipsilateral ear pain. Immunizations may prevent AOM in certain patients, such as those with recurrent infections. Influenza vaccine is more effective in preventing AOM in children older than 2 years of age than in younger patients possibly from impaired immune responses and immature host defense in infants and toddlers.20 Pneumococcal conjugate vaccine is protective against infection by vaccine serotypes only with a limited overall benefit for AOM.21 Antibiotic prophylaxis is no longer recommended for otitis-prone children because of increasing resistance. Avoidance or minimization of risk factors associated with otitis media, such as tobacco smoke and bottle feeding, is advised, but the effects of these interventions remain unproven. Infectious CVT requires immediate broad antibiotic treatment and - often - surgical treatment of the underlying disease (e.g. otitis, sinusitis, mastoiditis). Until the results of microbiological cultures are available, third-generation cephalosporins (e.g. cefaloxim 2 g tid or ceftriaxone 2 g bid i.v.) should be given. As in aseptic CVT, anticoagulation should be initiated immediately and symptomatic therapy of septic CVT should adhere to the principles outlined for aseptic CVT, although controlled studies on the efficacy of these measures in septic CVT are lacking. Prior to the introduction of the Hib conjugate vaccine, H. influenzae type b was the most common cause of bacterial meningitis in the United States.5 Routine inoculation of pediatric patients against Hib since 1991 has reduced the incidence of invasive Hib disease (i.e., meningitis and sepsis) in children younger than 5 years of age by 99 ,6 with mortality from Hib meningitis now less than 5 . The Hib vaccine is also recommended for patients undergoing splenectomy. Hib meningeal disease is often associated with a parameningeal focus such as a sinus or middle ear infection. Increases in -lactamase-mediated resistance have changed the empirical treatment of choice from ampicillin to third-generation cephalosporins (e.g., ceftriaxone and cefotaxime). Treatment should be continued for 7 days, after which no further maintenance therapy is required. The onset of AOM in childhood is often associated with fever, lethargy, and irritability. Older children may experience earaches and decreased hearing. 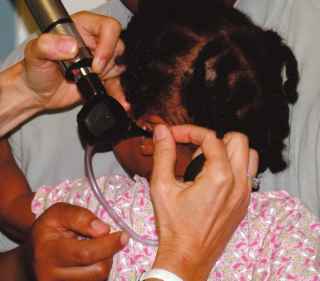 Examination with a hand-held otoscope demonstrates tympanic membrane redness, opacity, bulging, and poor mobility when pneumatic pressure is applied. However, there is considerable variability in the symptoms and signs of acute otitis media. 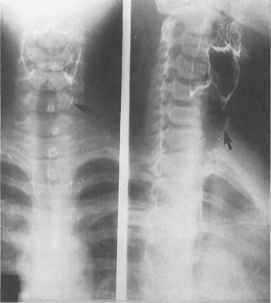 And suppurative adenitis of the lymph nodes located in the prevertebral fascia and is seen on a soft tissue lateral x-ray of the neck as prevertebral soft tissue thickening. The RPA may be preceded by an upper respiratory infection, pharyngitis, otitis media, or a wound infection following a penetrating injury into the posterior pharynx. It is helpful for the examiner to be familiar with the normal laryngeal structures. The differential diagnosis includes pharyngitis, acute laryngotracheobronchitis, epiglottitis, membranous (bacterial) tracheitis, cervical adenitis, infectious mononucleosis, peritonsillar abscess, foreign body aspiration, and diphtheria. These patients may present with stiff neck mimicking meningitis. Treatment of acute TM perforations is tailored to the mechanism of injury. All easily removable foreign bodies should be extracted. Corrosive exposures require face, eye, and ear decontamination. Antibiotics and irrigation do not improve the rate or completeness of healing unless the injury is associated with OM. Systemic antibiotics should be reserved for perforations associated with OM, penetrating injury, and possibly water-sport injuries (see Otitis Media above). Topical steroids impede perforation healing. Patients may also experience headache, ear pain, or neck pain. Symptoms such as hoarseness, difficulty swallowing, bronchial aspiration, aspiration pneumonia, shoulder weakness, tongue atrophy, and tongue fasciculation suggest the involvement of the lower cranial nerves. Deficits of these nerves are usually associated with large tumors. Patients with giant tumors may have facial palsy, Horner's syndrome, diplopia from invasion of the cavernous sinus, and posterior fossa symptoms such as ataxia, nystagmus, intracranial hypertension, papilledema, and occasionally paresis or plegias from brainstem compression. Distinguishing between vestibular neuronitis and bacterial labyrinthitis or labyrinthic ischemia is important. 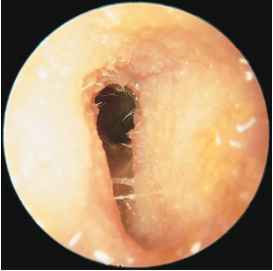 The diagnosis of bacterial labyrinthitis is based on hearing loss and otitis media or meningitis, and labyrinthic ischemia can be distinguished by hearing loss plus associated neurologic symptoms with a history of vascular disease. 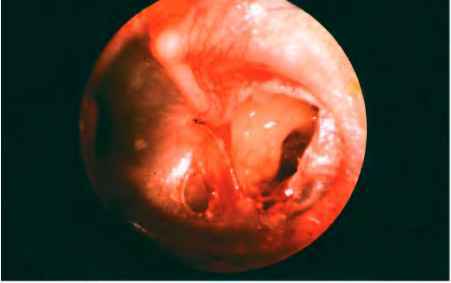 Traumatic perforation of the tympanic membrane may result from barotrauma (water skiing diving injuries, blast injuries, blows to side of head), ear canal instrumentation (cotton-tipped applicators, bobby pins, paper clips, cerumen curettes), or otitis media (see earlier discussion). The patient usually complains of acute pain that subsides quickly, associated with bloody otorrhea. Severe vertigo can occur but is transient in most cases. Persistent vertigo suggests inner ear involvement (perilymphatic fistula). Hearing loss and tinnitus are also common. Clinical signs Upper respiratory tract infection is usually characterized by a serous exudate from the eyes and nose, which later becomes a mucopurulent discharge. Infection may manifest as any of the following rhinitis (snuffles), pneumonia, otitis media, conjunctivitis, abscesses, genital infections or septicaemia. A brain abscess is a focal, intracerebral infection that develops into a collection of pus surrounded by a well-vascularized capsule. Although fungi and protozoa (particularly Toxoplasma) can also cause brain abscesses, bacterial causes are much more common. Streptococci are found in 70 of bacterial abscesses and are usually from oropharyngeal infection or infective endocarditis, whereas Staphylococcus aureus accounts for 10 to 20 of isolates and is more often found after trauma. Community-associated MRSA strains have been increasing. Enteric gram-negative bacilli (e.g., E. coli Proteus, Klebsiella, and Pseudomonas spp.) are isolated in 23 to 33 of patients, often in patients with ear infection, septicemia, or immunocompro-mise and those who have had neurosurgical procedures. This chapter covers plasticity in the central auditory system, most notably in the auditory cortex, from a variety of viewpoints. Neuroanatomical and neuro-physiological studies in animals as well as behavioral and functional imaging studies in humans will be considered. Plasticity in the auditory system will be compared to plasticity in other sensory systems, and the reorganization of the central auditory system during early blindness and deafness will be discussed. The findings from research in auditory cortical plasticity have important implications for the design of auditory prostheses, such as cochlear implants, in the deaf, and visual prostheses in the blind using nonvisual modalities. They also further the understanding and treatment of common ailments, including hearing loss and tinnitus in an aging population as well as the effects of otitis media in young children. Septic thrombosis of other sinuses is found as a complication of bacterial infection (e.g. otitis, mas-toiditis, bacterial meningitis), and is always accompanied by symptoms and signs of systemic infection. Septic CVT accounts for about 5 of all cases of cerebral thrombosis, but its mortality remains extremely high. In children, the nasopharyngeal tonsil, or adenoid, can occupy almost all of the nasopharyngeal space. Acute respiratory infections can cause acute adenoiditis with mucopurulent postnasal discharge, nasal obstruction and fever. Such episodes of acute infective adenoiditis are common in childhood and may lead to chronic adenoidal hypertrophy, mouth breathing, nasal obstruction and chronic mucopurulent postnasal discharge. The juxtaposition of the eustachian tubes to hypertrophied and inflamed adenoids is thought to be important in the causation of middle-ear effusions. The adenoid may therefore be important in the most common cause of hearing impairment in childhood - otitis media with effusion, more frequently known as 'glue ear'. Children with enlarged and inflamed adenoids often have difficulty eating because they are obligate mouth breathers. Symptoms include disturbed sleep, nocturnal cough and middle-ear effusions. Adenoidectomy offers an effective treatment in such children. CVT may be due to infectious and non-infectious causes. 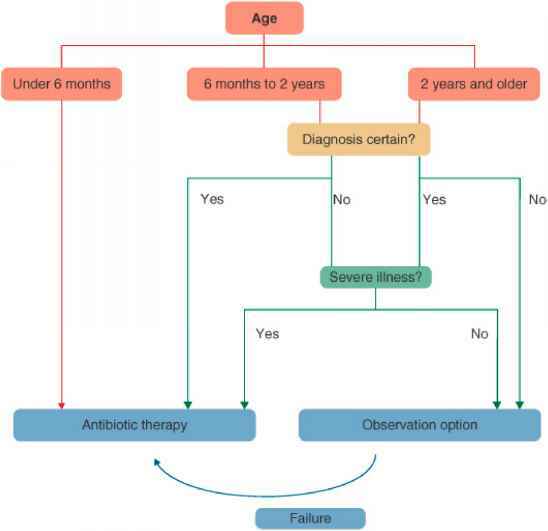 Septic CVT is observed as a complication of bacterial infections of the visceral cranium, namely otitis, sinusitis, mastoiditis and bacterial meningitis. The infectious agents reach the cerebral sinuses ascending Otitis, mastoiditis, sinusitis Septic CVT may be caused by bacterial infections of the visceral cranium, e.g. otitis, sinusitis, mastoiditis and bacterial meningitis. Aseptic CVT may be caused by the same causes as extracranial thrombosis (see Table 11.1). Lymphopenia and neutropenia are common laboratory findings with measles infection. Complications of measles include primary infections such as pneumonia, gastroenteritis, encephalitis, and the rare subacute sclerosing panenceph-alitis. Secondary infections such as otitis media, pneumonia, and adenitis may also occur.